Feeling itchy feet and a keen desire to travel once more, I realised that I didn’t need to take a plane and lumber around a ridiculously heavy backpack. London is filled with unknown hidden gems, with new adventures waiting around every corner. Uncover London is a series of posts where I pick somewhere at random from the Underground map, and go and explore it. I guess you could say this is travel philosophy. I hope you enjoy it. So much has changed since I ventured on what might be the last entry in the Uncover London series. It was, in fact, the 12th June that on a sunny Sunday I decided to explore an alien part of my home city. Since then, I’ve been to Glastonbury Festival and braved the slew of mud, rain and optimistic and dedicated revellers, I’ve moved to Bristol and set up a new home with my partner. I’ve bought a car, taken my nephew and goddaughter to Longleat Safari and had a monkey poo on my car. Only today I’ve completed a reading for the upcoming PGCE in Secondary School Teaching of English; visited Montego City to have the pressure of my tyres checked; got lost on the way to the park and stumbled across a garden centre where we bought some things to start the process of growing a herb garden, and sunbathed in St. Andrew’s park moving several times to escape the sound of numerous clads of young people inhaling nitrous through balloons in the beating down sun. Tired of reading all the materials that I should have been calmly devouring, as suggested by the head of the PGCE course way back in January, a retreat into writing seems fitting. Being that Pontoon Dock seems a life time ago, I will have to dig deep into my memory, prompted by the images captured. The freedom of randomly selecting an unknown location on the London Underground map led me to a brisk walk down Brondesbury Park to Kilburn station on the Jubilee Line. Descending into the city’s belly, that sense of excitement that I’d experienced in my years of travelling filled me with awe and anticipation. Not to bang on about it, but Uncover London for me has completely changed my feelings towards settling back into a more sedentary and predictable life in England. Having grown up travelling in a bus converted into a home from England to Morocco with various other hippy-types; spending five years living and travelling in Asia and then my most recent stint in the Americas as well as going to festivals such as WOMAD, Glastonbury and Stone Henge, exploration and immersion in different environments and cultures is something I flourish in. Realising that a sort of simulation of these fresh experiences could also be had in London has been indescribably liberating. For those of you who don’t know where Pontoon Dock is, and why would you, it is way over east in between Silvertown and London City Airport on the Docklands Light Railway. If that doesn’t mean anything to you, as like me you’ve never set foot in that part of the city, it is quite close to Greenwich on the Jubilee Line. As my destination approached, I noticed to my left a cable car gliding gracefully over the skyline. Since when was there such a thing and why didn’t I know about it? I decided to head to its foot after a stomp around the Dock. Advancing from the silent station, I crossed the road to try and find an entry to a wasteland I’d spotted where, in the distance I saw a huge derelict building. When I first arrived in London aged 18, with a combination of fear, trepidation, ardor and misplaced levels of country-living-based trust of humanity I swiftly found myself part of the city’s illegal rave scene. This consisted of crews of people that owned sound systems, playing a variety of music from the pneumatic-drill inspired Gabba to rolling Drum and Bass, breaking into disused buildings, illegally of course, and putting on epic parties. The thrill of becoming part of a sound system and reclaiming these spaces from their state of dereliction and filling them with loud music and a kind of “f**k you we won’t do what you tell us” freedom is potentially what propelled me to want to sneak into the old factory before me. And boy did I try. I walked some steps to be greeted by an intimidating and impenetrable high fence and signs saying things like “Do not enter, this site is extremely dangerous” and “No unauthorised entry, Trespassers may be prosecuted.” Undeterred, I scaled the fence into the bushes only to be repelled by thickets of brambles. I even shouted out at what I’d thought was a dog walker, only to realise later that the man was a security guard and the Alsatian his backup. Descending the un-permitting steps, I walked along the perimetre, stopping strangers to ascertain if they had any idea how I could get in. Met by confusion, I was declined any suggestions and so continued down another road where I reached the main entry point. The old and new sat side by side. A towering red-brick chimney sat in the centre of a mini roundabout opposite the heavily restricted entrance to what I could now see had been a factory called Spillers Millennium Mills. It stood defiantly and proud amongst soullessly sterile new developments that seem to define contemporary housing designs. Now, in the comfort of my new home with the Internet at my fingers I can divulge that it was a flour mill, built at the turn of the 20th century. Behind this beautiful white mill, where hundreds were employed, rested a small section of the Rank Hovis Premier Mill. I wanted to get into that building so badly and smell history with my own eyes that I loitered at the gates for an eternity awaiting one of the security guards in the distance to spot my eager face. If I were still in London now, I’d take inspiration from a blog I’ve just found where Ramsgatonian managed to actually get permission to visit the mill. Check out his photos as they are fantastic. I’m seething with healthy creative jealousy right now!!! Slightly deflated, I returned back down the road through banal subtopia to cast my eyes and stomp my feet along a permissible London. I soon realised that this was going to prove to be next to impossible. Skeletons of developments where the flesh was slowly being placed with cranes and hard hats refused me. I carried on regardless, trying to get to the river. I would not be deterred by the rapidly decreasing public spaces that activist comedian Mark Thomas had ranted hilariously about on his comedy tour Trespass. Walking through a discouragingly meticulous splosh of curvy green bushes, I finally arrived at the Thames. Silver constructions spread across the river, which I now know are called The Thames Barrier, built on the 1970s as a flood preventative. For anyone reading that has just dipped into this series of posts, one of the main ingredients involves no recourse to mobile technology or the Internet either before or during the adventure. Research post the trip is permitted, but in order to not spoil or affect my journeys I literally go somewhere new and get lost! Anyway, I digress. I stood overlooking the river as people walked their dogs and the waves lapped and licked the tiniest river beach beneath me. The rain began to fall in larger droplets than my clothing and soul were comfortable with so I ploughed on with the view to walking down the Thames until I found the cable cars. Easy right? Wrong. The privatisation of almost everywhere meant I was shut out left, right and centre. I re-entered the tedium of what would be homes for the affluent as planes lifted into the air in the nearby airport. I thought I’d found a way to keep the water by my side, only to be refused again by an area cut off by a new apartment complex. Shut out. Go away. This place is not yours. I’m a stubborn and persistent kind of girl so I retraced my steps and passed high fences all blocking my view of the structures along the water’s edge. Finding a park, I entered it hoping it would lead me to a river pathway. I did manage to gain entrance to a very old gate, which had once stood at the front of Harland and Wolff Ltd, a shipbuilders opened in 1924 and finally closed down in 1972. I chuckled to myself at the irony that the only place I could explore had been demolished and closed for several decades. Shut away from the river, I pondered at how the city was selling off more and more sections of itself for the benefit of whom? Private investors? Who lived in these sanitised spaces anyway? Annoyed, I walked alongside a busy dual carriage way ready to go home. Underneath the engines I saw a memorial to a young man called Tommie Harley who had been killed at that spot at the tender age of 20. I’ve just learnt he was bricked to death in the early hours of the morning, dying a few days before he turned 21. The plastic flowers and empty candle holders lay forlornly on the floor, so I rearranged them as best I could and prayed his soul was soaring high, as the memorial’s poem described. Disheartened by death, dereliction and denial I hung my head low in the rain. It was time to leave. As the lane narrowed in a dimly lit and industrial littered trap I spotted a smattering of colour and cheer that pierced the drollery and depression. Welcoming the change, I approached. 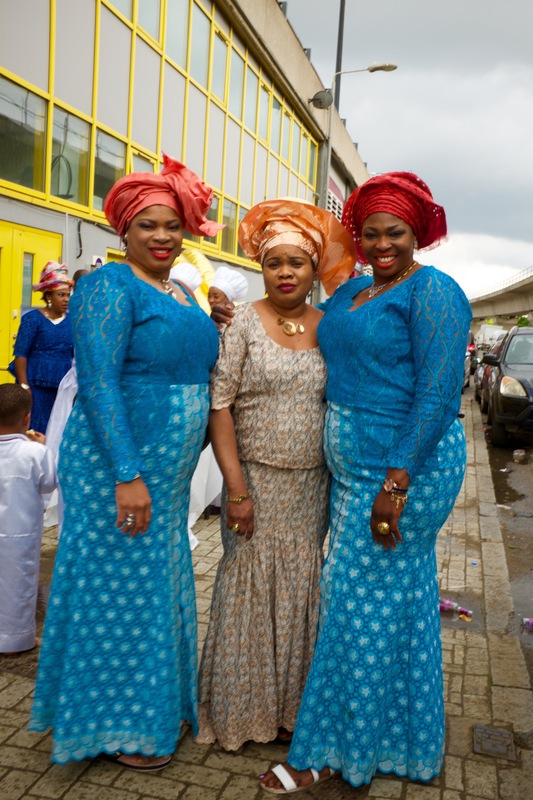 One of the industrial spaces was in fact a Nigerian church where a woman in white garb and head dress was surrounded by family members, friends and fellow worshippers in white. They were all being photographed to record her 50th birthday. Children scattered around and some of the women invited me over to take photos. They adorned brightly coloured clothes, red painted lips, exuberant smiles and warmth reminded me again that there are a hundred and one Londons all mingling together. Restored and filled with warmth in the persistent rain, I arrived underneath the cable cars. 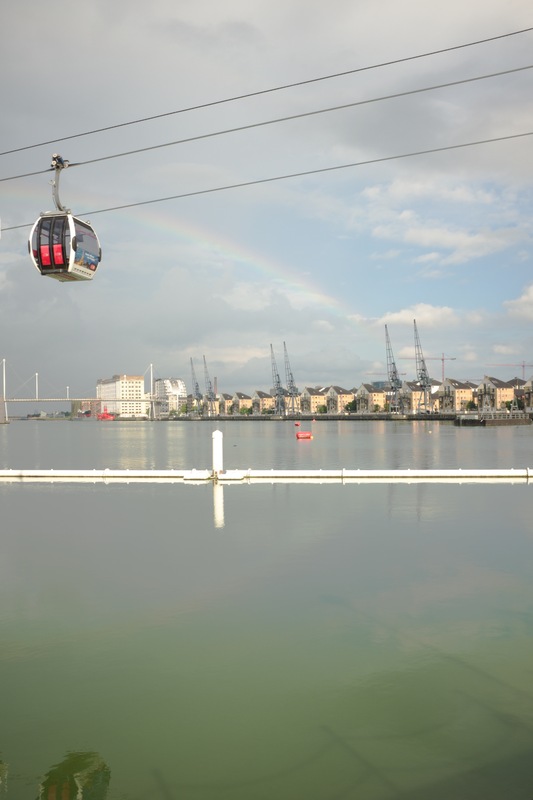 Approaching the entrance of the cable car I marvelled at the softness of a rainbow in the distance, reflecting on the water. Ever wondered what the Emirates Airline tube stop was, north of Greenwich, well it is the cable car!!!! You can use it with your Oyster card for a small fee of a few quid. It crosses the Thames between Greenwich Peninsula and the Royal Docks and at its peak reaches 90 metres. Beaming, I placed my Oyster on the yellow pad and entered the launch area. I had a car all to myself, as well as the Emirates video that played throughout the journey, providing information on the scene below. Elated, I soared above all the areas that had been shoving me out and away. I moved seamlessly across the industrial areas filled with life and death, commiseration and celebration. I laughed in the face of the enclosure of private space as a huge corporate entity carried me across the skies. Oh the beautiful irony. The Millennium Dome came closer, a construction I’d never expected to see from such a height. I felt like I’d won, won a battle against denial and refusal. I congratulated myself aloud, and fell in love with London all over again. Landing at the foot of the big white tent, I continued my adventures, which I shall merely describe through the pictures below, and as the warmth of the sun held me, I thanked the city for reminding me once again to expect the unexpected and to never give up, for even if the environment screams an obtrusive “no”, eventually something or someone will invite you to fly. Ha! I can now see all. Last Saturday, a sunny haze enswathed north west London. It was a haze that resembled the bright clouds that had hung mysteriously over a scene in one of the preceding night’s dreams, obscuring softly. Despite feeling a little ill, as had been the case for what felt like weeks, I decided to head out and explore London. It’d been a while since my last trip, as life had either taken over, or rather I’d allowed it to get in the way. It had been an eternity since the last adventure into my home city where I randomly select a tube station and uncover an unknown part of London. Yesterday I awoke filled with the joys of having control over my time again. I have recently joined the world of conventionality, no longer working from home and instead arising daily at 6:41am before setting off to a school in Harrow where I now teach. It is half term now, and the world is once again my oyster. The weather over the last few days had proved to be drab and depressing, which was not unusual for London at this time of year. When I awoke, I opened the curtains with trepidation. Would I have to dig deep to create the sunshine within, or would the skies illuminate a city of possibility and opportunity? Pulling back the material, the naked tree outside my window protruded with a promise to bloom soon, and thankfully behind it lay a clear blue sky. Having been uncomfortably reclusive over the Easter weekend, the sight of the sun inspired me to try and shake off the isolation and head into the city to explore. Deliberating over which coat to wear, I put my sturdy winter Parka on, grabbed my camera, a bottle of water and descended the hill to Queen’s Park tube. Immediately I regretted my choice of clothing as I began to swelter in the late morning sun. 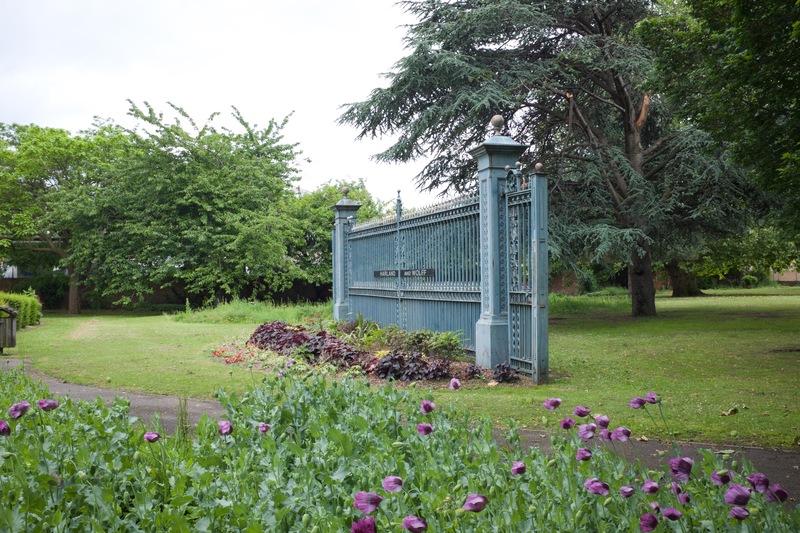 Never one to admit defeat, I continued down Brondesbury Park, past families, lovers and friends who emitted a vibrant, positive glow in the expanse of the holiday weekend. I’d decided a while ago that the next destination for the Uncover London series would be Cockfosters, the end of the Piccadilly Line, miles away in God-knows-where. I knew nothing about the area, and this was an integral part of my trip. I had not looked it up online, and had shut my ears when anyone I’d discussed my idea with had a story to offer about Cockfosters. All I knew is that I’d heard the name on the Underground’s speakers for many years, that it was far away, and that the name was an unattractive mixture of body-part slang and a tasteless English beer. This is the second instalment in a series entitled Uncover London in which I ditch travelling with a passport and backpack, and delve into the city’s hidden gems. The first place I explored, Island Gardens, was chosen at random from the underground map, and was selected based on its exotic and enticing name. This post is about my trip to Boston Manor, an area a dear friend and I passed through en route from Heathrow Airport. We were returning from an extremely colourful non-conventional wedding in Poland. My friend had been sat next to a ridiculously handsome man on the plane, with whom we continued our journey back into London on the tube. As we trundled through Boston Manor, I decided aloud that this would be the next location that I’d rove. The handsome man exclaimed that Boston Manor was “really boring,” and “apart from a dull high street, there was absolutely nothing to see.” That consolidated my choice, motivating me to counter his subjective observations by seeking to find beauty in banality. One day, whilst sitting alone together with hundreds of nameless commuters on a tube heading somewhere, I lost myself in the map of coloured lines. I’d been back in England for a few months, and was daydreaming about the freedom of travelling with a backpack, camera and endless time. As I scanned the various train’s paths, it dawned on me I needn’t venture too far for my next trip as London was brimming with the unknown. I’d heard a plethora of names over the tannoy for years, but had never thought of visiting these places. I decided I would explore the city that I lived in without a cumbersome backpack and passport but with the same intrigue and desire.